Guide your little swimmer into a deep blue dreamland with this whimsical bedding set. By day she strolled on two legs, but come sundown, she grew a magical fin to send her into a deep blue dreamland. Float your little swimmer into a sleep as gentle as the rolling tide with this whimsical bedding. 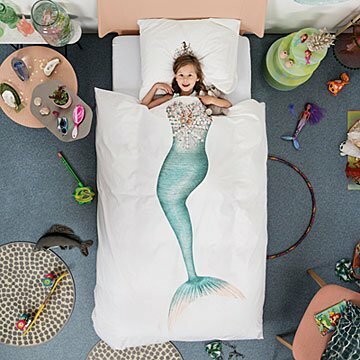 Featuring a printed pillow crown and glittering bodice duvet cover, she'll reign as queen of the seahorses all night long. Designed by Peggy van Neer and Erik van Loo in the Netherlands. Made in Portugal. While most designers are creating what you wear and use in the daytime, Dutch artists Peggy van Neer and Erik Van Loo want to keep you stylish while snoozing. When Peggy couldn't find a single duvet to fit her creative tastes, she called on her best design friend, Erik. Together they decided to make bedding with high-quality photographic prints, starting with a duvet made to look like a cardboard box. While the initial concept was more adult and skewed political, the following ideas for children packed a whimsical punch. Most children's bedding is busy and filled with bright colors, but Peggy and Eric's designs have a sense of humor with high sensibility. It allows your sophisticated home design to remain that way even in a child's room. Wash with warm water, inside out. Pre-shrunk and suitable for dryer. Includes twin sized duvet cover and matching pillowcase.